Remember when I promised this list to you a while back when doing the best Tom Cruise singing scenes? Well, I wasn’t kidding. Okay, I was, but now we’ve run out of ideas for Top Fives. With The Cruiser all set to go sprinting again this summer in spy-com Knight And Day, now is as good a time as any to check out his best dashes. Every actor has his forté. For Samuel L Jackson, it’s shouting. For Al Pacino, it’s shouting louder than Samuel L Jackson. Tom Cruise, however, comes from the Yasmine Bleeth school of thesping. Always have him running. To the untrained eye, every one of Cruise’s runs is the same. Look closer and you will see the man has an amazing repertoire of runs. On the phone, in a suit, on top of a building… this is a guy who, as Vanilla Sky proves, can run in his sleep. Going to the cinema and seeing a Tom Cruise movie in which he doesn’t run is like going to a Michael Bay movie which doesn’t have explosions. Tom Cruise movies without Tom running just don’t make sense. Lions For Lambs – no Cruise running… rubbish. Tropic Thunder – no Cruise running… not as funny as it should have been. Valkyrie – no Cruise running… Hitler survives. Cruise still runs an awful lot on screen these days for a man his age, but in terms of speed he hit his stride around the early 90s. We haven’t clocked his movie dashes, but we’re willing to bet that one of his sprints in The Firm would be his personal best. There is a late foot chase in this movie yet The Cruiser really lets fly a little earlier when running down a suburban street. Probably the best running in a legal drama ever. Some of us dream about falling from a great height or losing our teeth. Not Tom. He dreams about running. In Times Square. Had Vanilla Sky ended five minutes after it began, it would have been the greatest movie about Tom Cruise running in his dreams ever made. More than two hours of introspective guff later, all you can remember is The Cruiser’s own mini New York marathon. Steven Spielberg isn’t one of the greatest directors of all time because he made ET and Schindler’s List. He’s one of the greatest directors of all time because he takes Tom Cruise and makes him run his little Risky Business socks off for an entire movie. His running in War Of The Worlds gains extra points because he’s running from aliens. 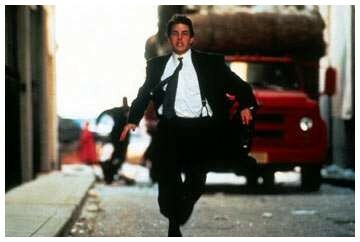 If only Spielberg’s Catch Me If You Can had been a movie about Tom Cruise running. The third Mission: Impossible movie was not about competing with Bourne or Bond – it was about showing that a man in his 40s can still do a helluva lot of running. A smorgasbord of sprinting, it has Tom running down skyscrapers, running from fighter jets and running while talking to Simon Pegg on the phone. Yet none of these can beat the moment where his little legs defy gravity itself by running vertically up the walls of the Pope’s house. The tagline for Cruise-whipper Spielberg’s excellent sci-fi was ‘Everybody runs’. Of course, it should have been: ‘Tom Cruise runs. A lot’. What Olivier was to Shakespeare, Cruise is to running, and Minority Report is his King Lear. He runs into houses, he runs downs alleys, he runs out of subways. Heck, he even runs a bath! 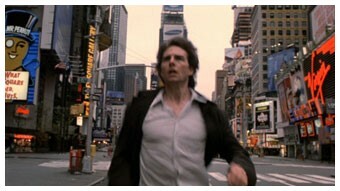 WHAT ARE YOUR FAVOURITE TOM CRUISE RUNNING MOMENTS? This entry was posted on June 16, 2010 at 4:53 pm and is filed under TOP FIVES with tags Minority Report, Mission: Impossible, Movies, Steven Spielberg, Tom Cruise, Vanilla Sky. You can follow any responses to this entry through the RSS 2.0 feed. You can leave a response, or trackback from your own site. check out this great Tom montage…. hahaha, great list. minority report wins by a long shot, he runs a shitload in that. time to give that one another watch. He…he… say what you will about the Cruiser but he does have a great sprint style. He’ll surely do a lot of that in his new action-packed movie, which is basically another Mission Impossible! This is actually a great idea for a list. I’ve always wanted to do something so crazy on the WTF scale that people have to read … a list on Tom Cruise alone wouldn’t do it for me. So thanks for the inspiration … which will be manifested at some other time. And I’d put the MI3 scene as #1, if not for Cruise but for PSH who rocked that movie. That should be his audition tape for the Penguin if Nolan ever decides to put the character in the series. Yep – although it isn’t technically running, the wonderful camera-tracking-around-van-driving-fast shot in War of the Worlds is perhaps my favourite “Cruise moving fast” bit. If only becaus eit combines his other major skill, providing exposition in an intense manner. Oh, I’ve passed you guys on a meme-y related meme-thing, if you’re interested. There’s only one answer, he must have seen North by Northwest as a kid and wanted to grow up to be Cary Grant. Couldn’t do better than MI:III or Minority Report. Solid list, gentlemen. Hahaha! Oh, Tom. He is such a great, intense runner. 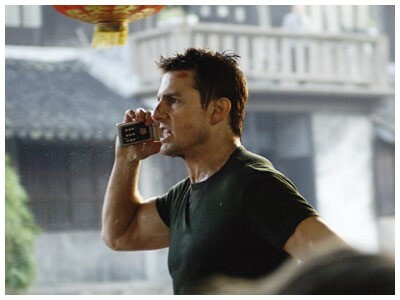 My personal favorite is Mission Impossible III with that great bridge scene thanks to JJ Abrams, but your list is great. i’ve got to go with the aquarium restaurant scene in the first MI as my favorite. he’s running AND jumping to get away from tons of water, as fish slide by all around him. A very funny idea for a post. This was great. My favorite Tom Cruise moment is the Family Guy spoof showing why Tom Cruise runs in all of his movies….very funny stuff. 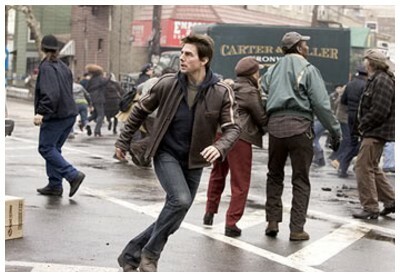 I went and saw Knight and Day, and every time I see a movie w/Tom Cruise in it I sit there consciously waiting for the Tom Cruise Running Scene. My favorites are The Firm (classic) and Mission Impossible 3.